website needs updating. The house needs scouring. To top it off, there are no. snacks. in. this. house. Honestly, a chocolate chip cookie would cure my lethargy. I'm certain of it. Instead of a sugar boost, I sloshed down to the big greenhouse to check on the few trays of seeds I planted Friday. ...my babies are already making an appearance! That tiny bit of green gives me hope that perhaps spring will arrive...someday. 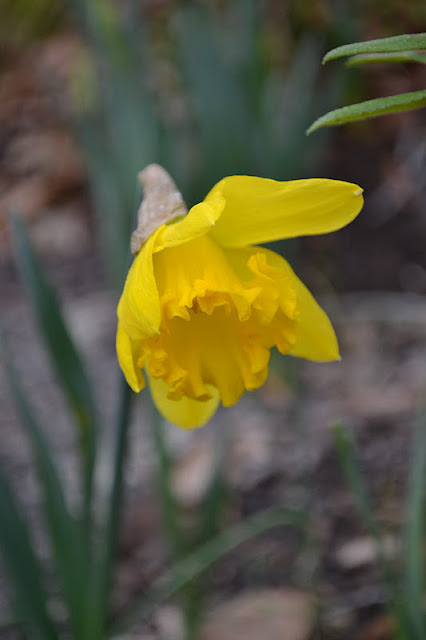 As an added perk, the first daffodil of the season popped...bliss! If I lean way back in my chair and turn my head a bit to the left, I can waste some more time gazing at its cheerfulness. Alas, it's time to get busy. My husband has accused me of treating my business like a hobby, and as much as it kills me—today, I agree. So, it's time to update the site and add all of the new offerings, give some crackers to my girl, and finish planting the herbs and heirloom flower seeds. Because tomorrow, it's time for tomatoes...lots and lots of tomatoes. I hope your Monday is far more productive than mine.